This is my home river I actually live on the bank of the Rogue. The middle and Upper sections of the Rogue offer a wide variety of fishing opportunities. Summer and winter steelhead, spring and fall Chinook salmon, and coho salmon all make strong runs through these sections. Rainbow trout inhabit the whole river, but are most concentrated in the uppermost stretch of the Rogue, known as the Holy Water. The Lower Middle Rogue runs hrough the towns of Gold Hill and Grants Pass. It offers the most access of any stretch, offering no less than 19 parks with boat launches. Winter steelheading is best from December through March, spring Chinook run from May through July, summer steelhead swarm in this section from July through October, fall Chinook and coho move in from September through November, and winter Steelhead ply the waters December into March. Every day of the year offers the potential for great fishing. The Upper Rogue is the most popular stretch for steelhead fly fishing. Thousands of summer run steelhead converge in the upper river, a combination of "half pounders" (small steelhead that have only spent a season or less feeding in the ocean) and full sized steelhead (from 4 to 15 pounds, and sometimes even bigger). August through November is the prime steelhead season, and October is generally the best month. Fall offers some incredible Salmon and Steelhead fishing down the ROGUE RIVER CANYON. 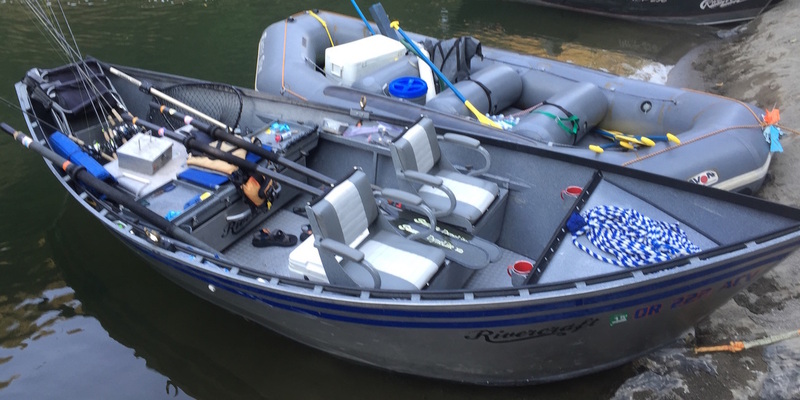 And for the avid water fowl hunters we offer the ROGUE RIVER BLAST & CAST. Full-Day Fishin trip - $225 per person for 2 or more people. 3/4 Day Fishin Trip - $200 per person for 2 or more people. Half-Day Fishin Trip - $175 per person for 2 or more people.